Protect and organize pens, pencils, charcoal, blending tools, inks, small accessories and more. 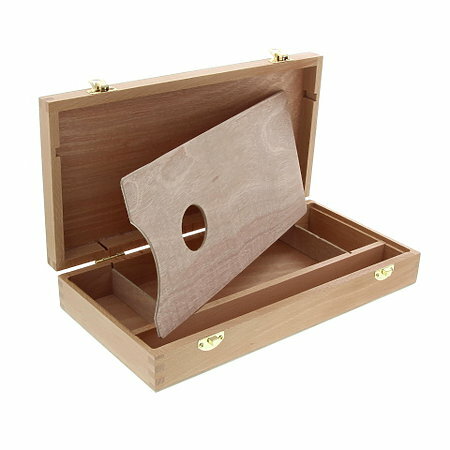 This hand sanded box is constructed of hardwood and features durable finger-joint construction. It is finished with sturdy brass latches and hinges. The sketch box measures 12-1/2" x 6-1/2" x 2-1/8" and includes a 5-1/2" x 11-5/8" artist's palette that fits securely over the interior compartments. The interior is divided into four compartments, one long, one large and two small.